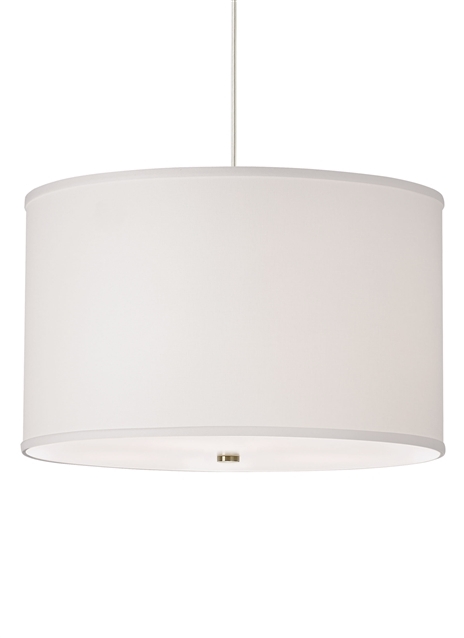 Simplicity and sophistication embody the characteristics of the Lexington Pendant by Tech Lighting. The large fabric shade is suspended from a round canopy and features a glass diffuser for a non-offensive glare-free wash of light. With its classic and universal design, the Lexington is ideal in places such as hallways, bedrooms and kitchen islands. Also included in the Lexington family is the Lexington Ceiling and Lexington Wall, simply search for the Lexington Pendant to find its closest relatives. Available lamping options include LED and no-lamp allowing you the choice of your preferred lamping. all LED lamping options are fully dimmable to create the desired ambiance in your special space. Rated for (4) 100 watt max, E26 medium base lamp (Lamp Not Included). LED includes (4) 120 volt 9.5 watt, 258 delivered lumen, 2700K medium base LED A19 lamps. Fixture is provided with six feet of field-cuttable cable. Dimmable with most LED compatible ELV and TRIAC dimmers.